The Vietnamese adopted the baguette from their French colonists and put it to very good use in these delicious ‘Saigon sandwiches’. This is the perfect way to use up leftover roast meats, especially pork, and ideally Chinese BBQ-style char siu pork. This recipe fuses techniques from Andrea Nguyen’s book ‘Into the Vietnamese Kitchen’ with inspiration from Saigon Sandwich*, by far the best hole-in-the-wall bánh mì purveyor in all of San Francisco. 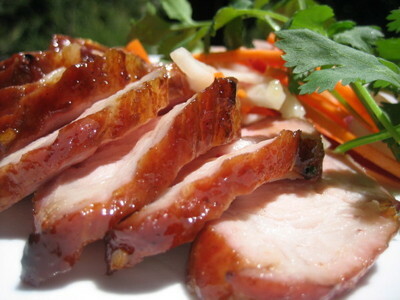 This is a popular Chinese barbecue dish, also common in Vietnam, where it’s called thit xá xíu. 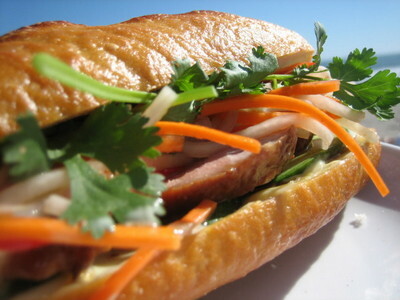 It is absolutely delicious with rice and salad, in bánh mì (Vietnamese baguette sandwiches), in steamed buns or just on its own as soon as you’ve sliced it. This recipe is thanks to Andrea Nguyen, author of ‘Into the Vietnamese Kitchen: Treasured Foodways, Modern Flavors’.